Corvette Earrings on this page represent model years 1984-1996 (known as the C4 Corvette Generation). These USA-made 14k gold and sterling silver Corvette earrings are highly detailed and hand finished for supreme quality. You will also find items made in alternative metals such as stainless steel. 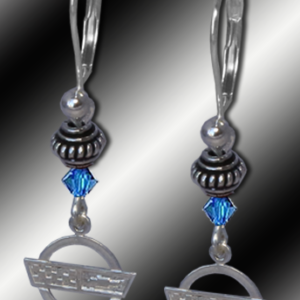 C4 Corvette Swarovski earrings sport the C4 emblem with your choice of Swarovski crystal. Disc measures 5/8” and overall length is 1-7/8″. Made of stainless steel. If you need a color not listed, please contact us. Swarovski crystal colors can closely match your car color or choose a favorite color. C4 Corvette sterling Swarovski cube leverback emblem earrings with your choice of crystal color. Choose crystal color below and picture will change to show your color choice. Swarovski crystal colors can closely match your car color or choose a favorite color. If you need a different color, please contact us. 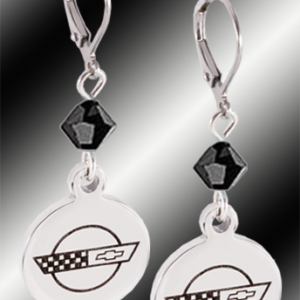 C4 Corvette emblem leverback earrings. Emblem width is 1/2”. Overall length is 1″. Made in 14k gold. Matching pendant is available. 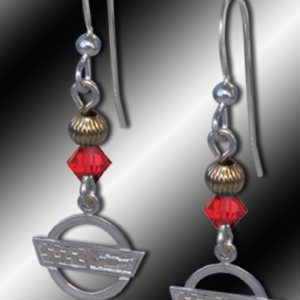 C4 Corvette emblem leverback earrings. Emblem width is 1/2”. Overall length is 1″. Made in sterling silver. Matching pendant is available. C4 Corvette sterling silver and gold-filled Swarovski crystal earrings with your choice of crystal color and choice of French Wire or Leverback style (French Wire style shown on all photos). Choose Style and then pick Crystal color (picture will change to show your CRYSTAL COLOR choice). If you need a custom color not listed, please contact us. Swarovski crystal colors can closely match your car color or choose a favorite color. C4 Corvette sterling silver Swarovski bead earrings with your choice of crystal color and choice of French Wire or Leverback style (Leverback style shown on all photos). C4 Corvette emblem enameled (red, black and yellow are hand painted) leverback earrings. Measures 7/8″ x 1-3/8″ long. Made in 14k gold. Matching pendant is available. C4 Corvette enameled (red, black and yellow are hand painted) emblem leverback earrings. Measures 7/8″ x 1-3/8″ long. Made in sterling silver. Matching pendant is available.